The Bulls Saturday got tangled up in Washington gridlock, their offense stalling as they lost to the Washington Wizards 101-90. The Bulls returned to their familiar poor starts, trailing by seven points in the first three minutes of the game and never taking a lead. The Bulls tank then went dry to close, failing to score in the last four minutes after making a last run to get within seven points. The Bulls fell to 19-36. Washington is 32-24. The Bulls had seven players score in double figures, but no one could make it big as Justin Holiday led with 15 points. Bobby Portis had 13 points, but was ejected late in the game for a flagrant foul. Lauri Markkanen, Robin Lopez and David Nwaba all had 12, Jerian Grant had 11 and Denzel Valentine 10. Markkanen and Valentine each also had 10 rebounds. Holiday had four steals and Grant eight assists. The Bulls were nine for 32 on threes. Kris Dunn remained out with the concussion he sustained Jan. 17. He could return before All-Star break this week and apparently intends to compete in the Rising Stars game in Los Angeles with teammate Lauri Markkanen. Zach LaVine also was out. He isn’t playing in the second of back to back for now in his return from surgery. That could change later this season. Valentine started for LaVine. John Wall was out for the Wizards along with Markieff Morris. It was a deadly start for the Bulls, a turnover to start and then five of six shots missed and two more turnovers to fall behind 9-2. The Bulls then continually lost Wizards point guard Tomas Satoransky, playing for Wall, who was wide open for three straight scores and eight straight points for a 19-7 Washington lead. The Bulls got within 30-22 after one quarter as Portis began a personal offensive of five straight shots. 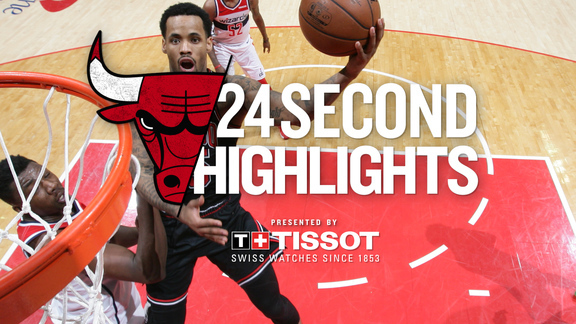 But it wasn’t until the Bulls began to rebound and look ahead, passing by Valentine, Grant and Ryan Arcidiacono enabling the Bulls to get on a 9-4 run midway through the second quarter to get within 43-41. Though Markkanen wasn’t shooting well, the Bulls again failed to find him often, his first shot not until eight minutes into the game and then several rushed. Satoransky again burned the Bulls after that, totaling 15 in the first half as the Bulls tuned into another dry stretch of seven possessions without a score, three of them turnovers, as the Wizards moved out to a 56-46 halftime lead. Portis led the Bulls with nine points off the bench while the Bulls were five of 17 on threes. Washington moved the ball nicely and had 16 assists on 22 baskets. The Bulls sought out Markkanen more in the third quarter as he scored on a pair of posters. Plus, Lopez got going rolling inside effectively against Marcin Gortat. The feisty Lopez also picked up a career most ninth technical foul of the season helping David Nwaba after some pushing with Mike Scott. After falling behind by 14 early in the third, the Bulls drew within 71-64 with Lopez and Markkaknen. But the Wizards got a pair of late threes on blown coverages and Washington went into the fourth quarter leading 82-70. 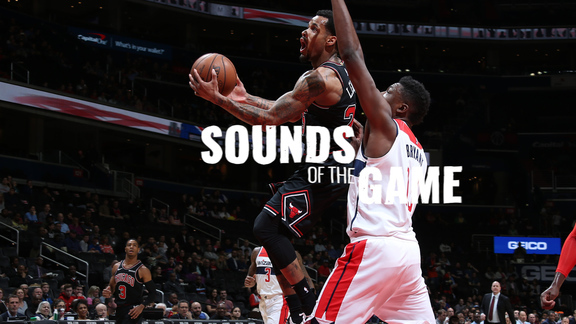 Portis banged in a pair of jumpers to open the fourth quarter, but the Bulls offense remained sluggish while the Wizards kept up the movement to counter the Bulls. Little used Jason Smith’s back to back baskets gave Washington a 95-79 lead with 7:46 left. The Wizards maintained the margin even with little contribution from Bradley Beal. The Wizards’ shots began to go awry. Threes from Markkanen and Holiday in an 11-2 run enabled the Bulls to get within 97-90 with 4:12 left. But Markkanen missed an open three and the Bulls then failed to defend Satoransky again as he made another three in his career high night. Satoransky then had to leave the game shortly after with a hard foul by Portis on a baseline drive. Portis was ejected with a flagrant two for the excessive contact with 2:35 left and the Bulls trailing by 11.